If you haven't yet contributed to one or more tsunami relief funds, you can do so with a few clicks of the mouse. To its credit, Apple has published a list of several relief agencies on its home page. I'll repeat them here. A few minutes ago, five deer trotted past my office window here in downtown Albion, California (population 398). I joked to my wife that they'd better rest up for tonight. 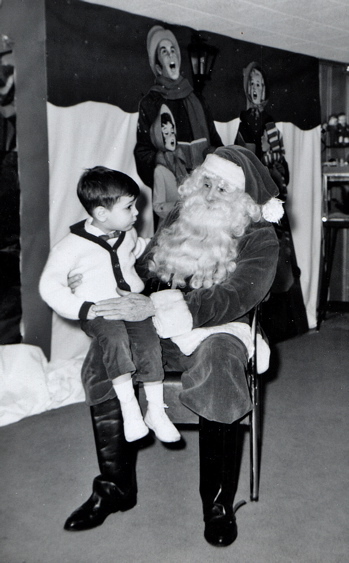 This photo, taken around 1964, shows your humble host sitting on Santa's lap. But that's no ordinary Santa -- that's my dad. George Heid was a radio and recording industry pioneer, a singer and songwriter, and an actor. At Christmas, he'd frequently don his Santa suit for charity events and children's TV shows. He was also a master of what I like to call the analog hub. I grew up with his 16mm movies, black-and-white photos, and family audio recordings, and I guess it's no surprise that I embraced movie making, photography, and audio in my own personal and professional life. Yesterday marked the thirty-first anniversary of my father's death, and I always reflect on his life and his influence at this time of year. Back in 1998, I made a digital holiday card containing a QuickTime VR panorama and a recording that my dad made in the 1940s. Every Christmas, I like to unpack this digital ornament, dust it off, and spend a few minutes in the company of the Ghost of Christmas Past. So check it out and pass it on. And have yourself a merry little Christmas. Usually, the only time I feel this influential is when I get out a movie projector and cause people to stampede for the door. Yesterday, I posted a tip about deleting songs that you've never played. I ended my post by saying that this chore seemed to be a perfect one for AppleScript -- and more specifically, for Doug Adams, whose collection of AppleScripts for iTunes can make the program sit up, roll over, and beg for peanut butter toast. This morning's email brought, well, 23 offers for inexpensive pharmaceuticals, six warnings to update a Citibank account that I don't even have, and two offers dealing with unfaithful wives. It also brought word from Doug: he'd taken the challenge and written the script. So. If your iTunes library is cluttered with songs you never listen to, check out Delete Tracks Never Played, the newest addition to Doug's AppleScripts for iTunes. And heed Doug's advice: Use with extreme caution. If you'd rather have more manual control over the culling process, use the instructions in yesterday's tip. Me-commerce department. I'd be missing an opportunity to shamelessly hawk my book if I didn't mention that its bundled DVD not only contains two hours of iLife instruction, but also a large collection of Doug's AppleScripts for iTunes. Not to mention a library of GarageBand loops, fully functional iMovie plug-ins and iDVD themes, and example files. All for $20.99 on Amazon. Learn more, and grab my free holiday update while you're at it. On his must-read Mac 911 blog, my Macworld colleague Chris Breen recently fielded a question from a reader who wanted to know how to easily remove songs he never listens to. Chris offered some great suggestions, and some readers chimed in with more. No one has offered the following technique, though, so I'll add my voice to the chorus. 1. Create a smart playlist whose criterion is Play Count is 0. 2. In the Source area of the iTunes window, select the smart playlist. 3. To delete all the songs that iTunes has identified as, shall we say, neglected, choose Select All from the Edit menu and then press Option-Delete. When iTunes asks if you want to remove those items from the library, click Yes. When iTunes asks if you want to move those files to the Trash, click Yes again. As an alternative to deleting all the songs, you can look over the smart playlist and delete tunes on a song-by-song basis. The key to this technique is the Option-Delete keyboard sequence. Normally, iTunes won't let you delete a song from a smart playlist. That makes sense, since a smart playlist is one whose contents iTunes determines based on your criteria. But holding down the Option key while pressing Delete overrides this behavior and tells iTunes to yank the song from your library. This chore of cleaning out neglected tunes seems to be a perfect one for an AppleScript. I poked around Doug Adams' invaluable Doug's AppleScripts for iTunes site, but didn't find a script that does this job. Thwock! The ball's in your court, Doug! I always enjoy being a guest on Shawn King's Your Mac Life, a weekly Internet radio show devoted to all things Mac. I'll be a guest on tonight's show, talking about a feature I wrote for the current issue of Macworld. The feature (not available online) is called "From Tape to CD," and it describes how to digitize old audio recordings and phonograph records. My guest slot will be at approximately 8:15 Central time. Tune in! Got holiday PDF? Did you get your copy of my free book update, There's No Place Like iLife for the Holidays? 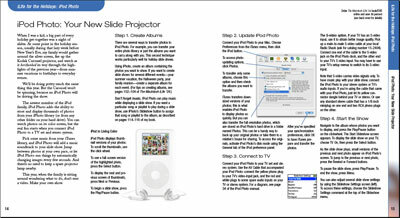 It's still available: 16 full-color pages covering iTunes, iPhoto, iMovie, iDVD, and iPod Photo. Get it now. I haven't been posting many dispatches here lately -- so what have I been up to? I've been working on your holiday present. I've just completed a 16-page, 10,000-word update to my book. The update is called, with apologies to Robert Allen and Al Stillman, There's No Place Like iLife for the Holidays. The update is devoted to using iLife during the holiday season: how to buy music for someone at the iTunes Music Store, how to combine multiple digital cameras to multiply your picture taking power, how to make better movies and DVDs, how use iMovie freeze frames for cool, holiday-themed effects, and more. 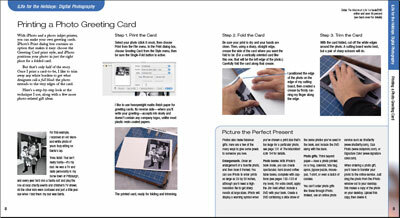 There's also a section on using iPod Photo to replace your Kodak Carousel slide projector for those holiday slide shows, and there are step-by-step instructions for printing (and properly folding and trimming) your own photo greeting cards. As you can see, the update shares the same beautiful design as my book, The Macintosh iLife '04. And it's free -- my way of saying "happy holidays" to the Mac world. The back cover of my holiday update contains a special offer: get a free copy of our instructional DVD, "Go Digital: Tips for Your New Camera." So grab the update, print it out, and put a little more sparkle in your holiday media. If you're shopping for present for the Mac user in your life, might I humbly -- aw, shucks, not-so-humbly -- recommend The Macintosh iLife '04. 300 gorgeous, full-color pages plus a two-hour instructional DVD -- for $20.99? No wonder MyMac.com called it "a screaming deal." Grab some excerpts, and then go scream for yourself.